SpyCrushers rep announces their 1080p and 720p HD Pro Series Spy Pen Cameras are now available for purchase on Amazon. 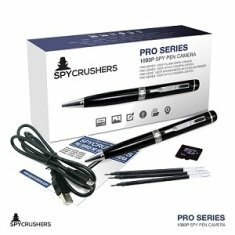 Geneva, IL - SpyCrushers rep announces their 1080p and 720p HD Pro Series Spy Pen Cameras are now available for purchase on Amazon. Recently at press conference held at SpyCrushers headquarters in Geneva, IL, Ryan Anderson president and Co-Founder of SpyCrushers announced their 1080p HD hidden camera pen and 720p HD spy pen are now available on Amazon. “We are pleased to announce the release of our Pro Series spy pen product line on Amazon. Our partnership with the giant online e-commerce store has grown over the years. Amazon continues to provide a great platform for us to reach new customers daily. Our 720p HD Pro Series Spy Pen Camera and our 1080p HD Pro Series Spy Pen Camera are our latest entries onto its online marketplace,” said Anderson. According to the Amazon product detail page for each hidden camera pen model, the 720p pen camera is available for purchase for $29.97 plus shipping. The 1080p pen camera model is being offered for sale at $49.99. Both include a 16GB micro sd card and 3 black ink cartridges with purchase. Both models feature a new replacement or money back product satisfaction guarantee if customers are not happy with their purchase. “Our Pro Series model spy pens are the best on Amazon. We offer a no hassle money back or new replacement guarantee against any customer dissatisfaction. As a bonus we include a sixteen gig micro sd card and three bonus ink pen cartridges. No other seller is offering such product confidence on Amazon. We have many competitors on the Amazon platform, but we consistently out sell them because our products outperform them all,” Anderson continued. The SpyCrushers 1080p and 720p HD Pro Series Spy Pen Camera can be found on Amazon when using the search phrase spycrushers spy pen inside any open search box found on any Amazon webpage.